Section 9 returns with a huge international act! Boasting releases on DEEP MEDi spanning a decade, GOTH-TRAD is one of the most respected icons of dubstep. 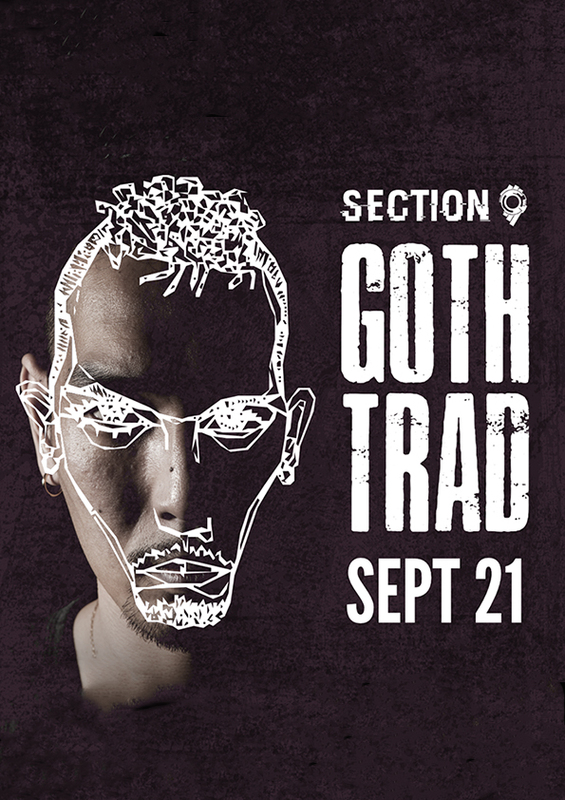 An innovative producer with a unique style, Goth-Trad has emerged from the Japanese electronic scene in the last decade as one of the most arresting artists of his generation. ‘The Sound Originator,’ Goth-Trad creates remarkable dance music with an abstract approach. Goth-Trad’s music career started in 1998, and he soon formed Rebel Familia in 2001 while continuing to work on his own. From abstract electronica to noise, from dub and reggae to jungle and rave music, grime to dubstep, Goth-Trad has always experimented and in the process developed his own unique style: blending influences and delivering music that is constantly evolving. Between 2001 and 2004 Goth-Trad grew his notoriety on the Tokyo underground and went on his first European tour. He also released his first album, Goth-Trad I, and opened for The Mars Volta during their 2004 Japanese tour. His second album was released in January 2005; titled The Inverted Perspective, it focused on the improvisational live style he had been developing in previous years which he would continue to refine to this day. In March he played in Korea and in the summer established a new style called Mad Rave. ‘Mad Rave’ is Goth-Trad’s own take on dance music, refined and musically distilled through years of work. This led to his third album, Mad Raver’s Dance Floor released in November 2005. Over 10 tracks the album condenses more than 10 years of dance music into an amalgamation of styles which flows seamlessly. The release tour for the album traveled to Berlin, Paris, Metz, London and 8 Japanese cities. It was with this third album that Goth-Trad would finally break into the international market during 2006 thanks primarily to one track - Back To Chill - which would soon become synonymous with the Japanese dubstep scene. Inspired by the grime sounds he’d heard in London in previous years, Back To Chill also became the name of Goth-Trad’s monthly dubstep night in Tokyo and saw a release on the UK label Skud Beats, his first official single on a non-Japanese label. At the same time Goth-Trad embarked on his fourth European tour, where he met with dubstep pioneer Mala from Digital Mystikz, at the seminal dubstep night FWD>>. This meeting led to Goth-Trad being signed to Mala’s Deep Medi Musik label and become a fixture of the international dubstep scene, which from 2006 onwards grew at an exponential rate and Goth-Trad soon became one of the genre’s most recognised and loved international artists. Goth-Trad released his first 12” single for Deep Medi Musik in 2007, Cut End. That same year he also released a new Rebel Familia album, including collaborations with legends Arie Up and Max Romeo. He continued to tour extensively in Japan as well as starting more regular European tours where he appeared at the legendary DMZ dances among others. His eclectic and varied live show made him a firm favourite of European audiences and he has toured Europe every year since 2007. With New Epoch marking yet another milestone in Goth-Trad’s career, the Japanese one-man army - as Kode 9 once referred to him - is set to continue on his unique path. Always charting new territories while staying true to what motivates him: making good and honest music that reflects the world around him. Alongside producing and touring, Goth-Trad still runs Japan’s most famous bass driven club night, Back To Chill in Tokyo city every month, inviting the newest local producers to play alongside the scene’s fore-runners such as The Bug and Kode9. In November 2014, he started his own record label, also called Back To Chill.